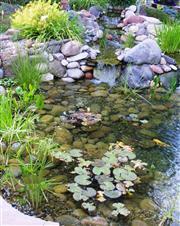 Do you have a water feature or small pond that needs cleaning and maintenance? Rely on our professional services! Right now it's time for Spring cleaning. Our full spring service usually involves relocating any fish temporarily, removing any spring algae bloom, and draining the pond. Then we pressure wash rocks or base surface, repair any leaks or liner issues, replace any fallen rocks or missing gravel, remove any overgrown plantings, fertilize lilies, and add plantings. 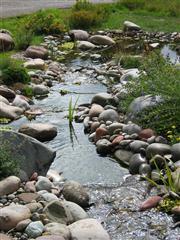 While cleaning, we often re-work streams and falls where needed for better sound and greater visual appeal. Once your pond is cleaned for spring, we provide regular treatments and maintenance services to keep it sparkling and make it a focal showpiece in your yard. We offer a wide variety of aquatic plants to enhance your pond, provide a natural look, help shade the surface for easier maintenance, and add flower color and interest. Contact us today to schedule a Spring clean and regular maintenance services!